How To Make A Paleo Party Platter. 2 years ago you’d never guess what our party platters used to look like… we’re talking doritos, salsa, store bought dip, rice crackers, a slab of cheese, a bag of starburst and always…. ALWAYS peanut m and ms. Crazy, right? We get it, buying packaged snacky foods is easy and at the time, probably delicious but those easy store bought ‘foods’ are full of absolute rubbish. So! Today we’re talking ‘how to make a paleo party platter’. 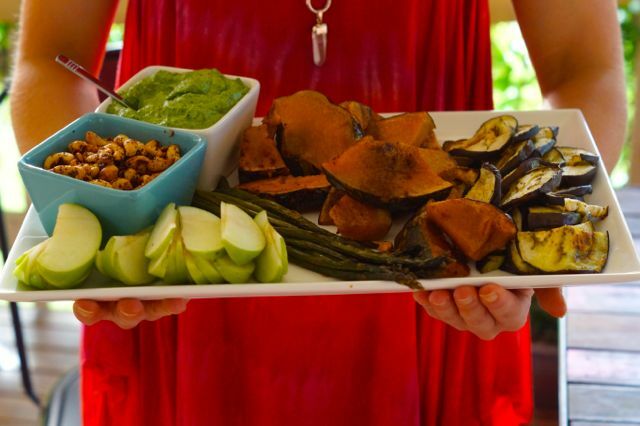 Not just any paleo party platter… the ULTIMATE paleo party platter! Don’t worry, it might look super duper fancy but trust us, we’ve stuck to our rules of quick, easy and delish! This paleo party platter took no time to whip up and if you’re organised, you can easily prep this platter the day before the party! Ok! So you’ve got all the ingredients you need, now it’s time to start getting this paleo party platter ready! Preheat your oven to 180 degrees celsius and line 2 x baking trays with baking paper. Chop your pumpkin, slice your eggplant and cut off the ends of the asparagus. Place the pumpkin on to 1 tray, drizzle with olive oil, season with salt and pepper and dust with paprika (we also have another roast pumpkin recipe you might like to use). Place the tray in to the oven for 20 minutes. Mean while, place the eggplant and asparagus on the other tray. Drizzle with olive oil and season with salt and pepper. Once the pumpkin has been in the oven for 20 minutes, turn over the pieces of pumpkin and place back in to the oven along with the tray of eggplant and asparagus for a further 20 minutes. Done! Yum! Allow to cool. In a medium heat fry pan, melt a little coconut oil. Place 3 cups of nuts in to the fry pan along with one tablespoon of paprika, a teaspoon of cinnamon and salt and pepper. Fry up until lightly toasted. Place in to a small bowl. We also have this delicious spiced nut recipe that you might like to use instead! In a food processor (we use our vitamix) place the basil, spinach, avocado, 1/2 cup of nuts, 1/4 cup olive oil, juice of 1 lemon, salt and pepper. Whiz until super smooth and place in to a small bowl. You could also make our paleo beetroot hummus, our regular cauliflower hummus or our guacamole! Thinly slice an apple and grab a hand full of dates! Alright, you’ve got everything ready to go! Now it’s just as simple as making it look pretty on a platter! Wa-lah! 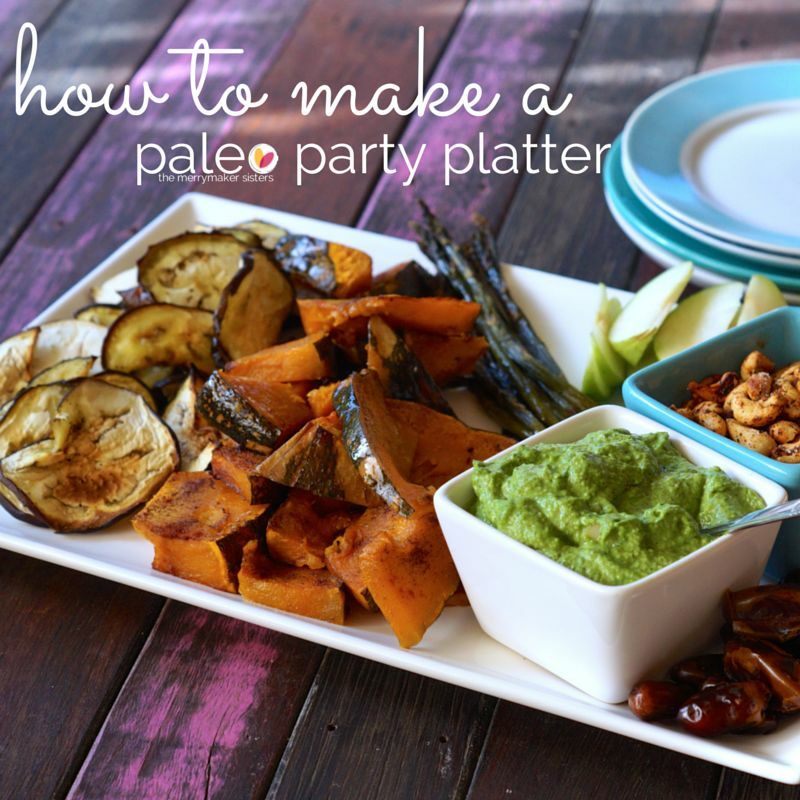 The ultimate paleo party platter! We could think of a zillion things to add to your paleo party platter! Think savoury crackers, some pumpkin fritters, delicious meatballs, crunchy plantain chips or sweet potato chippies or some mini frittatas! The options really are endless! Do you have a go-to healthy party recipe? If you do, we’d LOVE to hear about it! We’re putting together a menu for The Merrymaker Party and are definitely in need of some inspiration… from YOU!